Diane Krek is a graphic designer who began losing her vision 25 years ago. 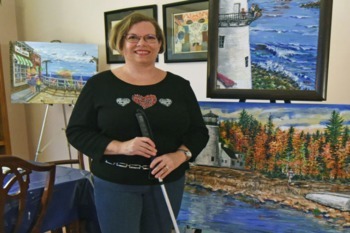 Like many people living with blindness, Krek refuses to let her condition stand in the way of making art and helping others. In 2016, she launched BLT Art for a Cause; it serves as a platform to sell her artwork. Krek donates a portion of the profits she makes selling prints to vision loss organizations, such as Foundation Fighting Blindness, Pennsylvania Council for the Blind and Lions Club’s Leader Dogs for the Blind program. We would love for you to share with us inspirational stories about individuals living with vision loss.